The term "anxiety.org" or '"us" or "we" refers to the owner of the Website. The term 'you' and "your" and "User" refers to the user or viewer of our website. Services related to or offered on the Site (hereinafter, the "Services") may include, without limitation, tools, applications, email services, bulletin and message boards, chat areas, news groups, forums, communities, calendars, and downloadable mobile applications related to the Site or provided through the Site. These TCU govern your use of the Site and Services that are provided. Please read this Agreement carefully before accessing or using the Site or Services. Each time you access or use the Site or Services, you agree to be bound by these TCU. If you do not agree to be bound by all of these TCU, you may not access or use the Site or Services. By using this Website, you agree that the exclusions and limitations of liability set out in any disclaimer in these TCU are reasonable. If you do not think they are reasonable, you must not use this Website. The medical information on this Website is provided "as is" without any representations or warranties, expressed or implied. No representations or warranties in relation to the medical information on this website are made. Without prejudice to the generality of the foregoing paragraph, Anxiety.org does not warrant that the medical information on this Website will be constantly available, or available at all, or that the medical information on this Website is complete, true, accurate, up-to-date, or non-misleading. We do not recommend or endorse any specific tests, physicians, products, procedures, opinions, or other information that may be mentioned on this Site. We do not provide medical advice, diagnosis or treatment, or legal, financial or any other professional services advice. You acknowledge and agree that your use of the Internet, access to the Site, and the use of the content are solely at your own risk. We are committed to protecting the privacy of children. You should be aware that this Site is not intended or designed to attract children under the age of 13. We do not knowingly collect, either online or offline, personal information from persons under the age of thirteen. If you are under the age of 18, you may use this Site only with permission of a parent or guardian. You are granted a personal, non-exclusive, non-transferable, revocable and limited license to access and use this Site strictly in accordance with these TCU. As a condition of your use of the Site, you warrant that you will not use the Site for any purpose that is unlawful or prohibited by these Terms or by any local, state, national or international law, rule or regulation. You may not use the Site in any manner that could damage, disable, overburden, or impair the Site or interfere with any other party's use and enjoyment of the Site including the transmittal or posting of any material that contains a computer virus or corrupted data. You may not obtain or attempt to obtain any materials or information through any means not intentionally made available or provided for through the Site. You will not modify, publish, transmit, reverse engineer, participate in the transfer or sale, create derivative works, or in any way exploit any of the content, in whole or in part, found on the Site. Anxiety.org's content is not for resale. Your use of the Site does not entitle you to make any unauthorized use of any protected content, and in particular you will not delete or alter any proprietary rights or attribution notices in any content. You will use protected content solely for your personal use, and will make no other use of the content without the express written permission of Anxiety.org and the copyright owner. You agree that you do not acquire any ownership rights in any protected content. We do not grant you any licenses, express or implied, to the intellectual property of Anxiety.org the Site, or our licensors and related parties except as expressly authorized by these Terms. This license may be revoked at any time for any violation of any of Terms. Some of the Services on the Site may require that you complete a registration process for an account by providing certain information including selecting a Username and Password. If you use these Services, you are solely responsible for maintaining the confidentiality of your account and password and for restricting access to your computer, and you agree to accept responsibility for all activities that occur under your account or password. You may not assign or otherwise transfer your account to any other person or entity. You acknowledge that the Site and its Operator are not responsible for third party access to your account that results from theft or misappropriation of your account. If you believe your account or password has been compromised or if there is any other reason you need to deactivate a password, you are to notify the Site immediately. You grant Anxiety.org and all other persons or entities involved in the operation of the Site the right to transmit, monitor, retrieve, store, and use your information in connection with the operation of the Site. Anxiety.org cannot and does not assume any responsibility or liability for any information you submit, or your or third parties' use or misuse of information transmitted or received using Site tools and Services. Neither Anxiety.org nor related parties will be liable for any loss that you may incur as a result of someone else using your password or account, either with or without your knowledge. You may be held liable for any losses incurred by Anxiety.org or another party due to someone else using your account or password. The Public Area of the Site may contain bulletin board and message services, chat areas, blog posts, news groups, forums, communities, personal web pages, calendars, and/or other message or communication facilities designed to enable you to communicate with the public at large or with a group (collectively, "Communication Services" or "Service"). These are public forums and any information that you post on the Site or through the Services may be seen by anyone on the Internet. Any user will have the ability to edit or delete their own posts after posting. You agree to use the Communication Services only to post, send and receive messages and material that are proper and related to the particular Communication Service. You are solely responsible for your own communications, the consequences of posting those communications, and your reliance on any communications found in the Public Areas. Posts to the Public Area do not reflect the opinions of Anxiety.org. In cases where you feel threatened or believe someone else is in danger, you should contact your local law enforcement agency immediately. If you think you may have a medical emergency, call your doctor or 911 immediately. When posting information on the Site or through the Services, use good taste when discussing sensitive topics. Post material that in our sole judgment is objectionable or restricts or inhibits any person or entity from using or enjoying any interactive features or other portions of the Site, or which may expose Anxiety.org or its users to harm or liability of any nature. Anxiety.org has no obligation to monitor the Communication Services. However, Anxiety.org reserves the right to review materials posted to a Communication Service and to remove any materials in its sole discretion. Anxiety.org reserves the right at all times to disclose any information as necessary to satisfy any applicable law, regulation, legal process or governmental request, or to edit, refuse to post or to remove any information or materials, in whole or in part, in Anxiety.org's sole discretion. Always use caution when giving out any personally identifying information about yourself or your children in any Communication Service. Anxiety.org does not control or endorse the content, messages or information found in any Communication Service and, therefore, Anxiety.org specifically disclaims any liability with regard to the Communication Services and any actions resulting from your participation in any Communication Service. Materials uploaded to a Communication Service may be subject to posted limitations on usage, reproduction and/or dissemination. You are responsible for adhering to such limitations if you upload the materials. By sending or transmitting to us content, images, video, audio files, creative suggestions, ideas, notes, concepts, information or other materials (collectively, "Submission Materials"), or by posting such Submission Materials on the Sites, you hereby grant to us and our designees a worldwide, non-exclusive, sublicenseable, assignable, royalty-free, perpetual, irrevocable right to use, reproduce, distribute, modify, create derivative works of, publicly perform, publicly display, digitally perform, sell, offer for sale and import such Submission Materials in any media now known or hereafter devised, for any purpose whatsoever, commercial or otherwise, without compensation to you. You represent and warrant that any person or entity named or pictured in such Submission Material has provided any necessary licenses, rights or authorizations to allow Anxiety.org's use of such Submission Materials. None of the Submission Materials disclosed or posted via message boards, chats or other public forums shall be subject to any obligation, whether of confidentiality, attribution or otherwise. If you wish to keep any business information, ideas, concepts or inventions private or proprietary, do not submit them to the Public Areas. All content included as part of the Service, such as text, graphics, logos, images, as well as the compilation thereof, and any software used on the Site, is the property of Anxiety.org, its suppliers, content contributors, and other respective owners (the "Content Owners") and protected by copyright and other laws that protect intellectual property and proprietary rights. You agree to observe and abide by all copyright and other proprietary notices, legends or other restrictions contained in any such content and will not make any changes thereto. Any use of the Content not expressly permitted by these Terms is a breach of these Terms and may violate copyright, trademark, and other laws and may incur severe penalties. Content and features are subject to change or termination without notice in the editorial discretion of the Site. All rights not expressly granted herein are reserved to the Content Owners. Using our Services does not give you ownership of any intellectual property rights in our Services or the content you access. You may not use content from our Services unless you obtain permission from its owner or are otherwise permitted by law. These terms do not grant you the right to use any branding or logos used in our Services. Don't remove, obscure, or alter any legal notices displayed in or along with our Services. We respond to notices of alleged copyright infringement and terminate accounts of repeat infringers according to the process set out in the U.S. Digital Millennium Copyright Act of 1998 (the "Act"). If you believe in good faith that materials on this Site infringe your copyright, you or your agent may send a notice requesting that the material be removed or access to it be blocked. Any notification by a copyright owner or a person authorized to act on its behalf that fails to comply with requirements of the Act shall not be considered sufficient notice. If you believe in good faith that a notice of copyright infringement has been wrongly filed against you, the Act permits you to send a counter-notice. This Site may contain links to other, third party websites ("Linked Sites"). The Linked Sites are not under the control of Anxiety.org and Anxiety.org is not responsible for the contents of any Linked Site, including without limitation any link contained in a Linked Site, or any changes or updates to a Linked Site. Anxiety.org is providing these links to you only as a convenience, and the inclusion of any link does not imply endorsement by Anxiety.org of the site or any association with its operators. If you choose to use the services provided by any third party websites, you may be asked by those sites to provide certain personally identifiable information. Anxiety.org is not responsible for the privacy practices of those sites. Please be aware when you leave our site, and read the privacy policies of each and every website that you visit. This Agreement applies solely to this Website. Anxiety.org is not responsible for the contents of any linked site or any link contained in a linked site. Certain services made available via this Site are delivered by third party sites and organizations. By using any product, service or functionality originating from this domain, you hereby acknowledge and consent that Anxiety.org may share such information and data with any third party with whom Anxiety.org has a contractual relationship to provide the requested product, service or functionality on behalf of this Site's users and customers. Your participation, correspondence or business dealings with any third party found on or through our Site and Services, including, without limitation, advertisers and other users, regarding payment and delivery of specific goods and services, and any other terms, conditions, representations or warranties associated with such dealings, are solely between you and such third party. You agree that Anxiety.org shall not be responsible or liable for any loss, damage, or other matters of any sort incurred as the result of such dealings. You agree to indemnify, defend and hold Anxiety.org, its officers, directors, shareholders, employees, agents, affiliates, licensors, suppliers, managers, contractors, sponsors and third parties, from and against any and all claims, actions or demands, losses, costs, liabilities and settlements, and expenses (including reasonable attorneys' fees) relating to or arising out of your breach of this Agreement, any allegation of infringement of an intellectual property right, or your use of or inability to use the Site or Services, any user postings made by you, your violation of any terms of this Agreement or your violation of any rights of a third party, or your violation of any applicable laws, rules or regulations. Anxiety.org reserves the right, at its own cost, to assume the exclusive defense and control of any matter otherwise subject to indemnification by you, in which event you will fully cooperate with Anxiety.org in asserting any available defenses. THIS SITE AND THE SERVICES, AND ANY CONTENT, TOOLS, PRODUCTS OR SERVICES DISPLAYED, ACCESSED OR OBTAINED ON OR THROUGH THE SITE AND SERVICES ARE PROVIDED "AS IS", "AS AVAILABLE", AND WITHOUT WARRANTIES OF ANY KIND, EITHER EXPRESS, IMPLIED OR STATUTORY, INCLUDING, WITHOUT LIMITATION, WARRANTIES OF TITLE, NON-INFRINGEMENT, AVAILABILITY, TIMELINESS, MERCHANTABILITY OR SUITABILITY FOR A PARTICULAR PURPOSE. WITHOUT LIMITING THE GENERALITY OF THE FOREGOING, ANXIETY.ORG, ITS LICENSORS AND THEIR AFFILIATES, SUPPLIERS, AND AGENTS DO NOT WARRANT AND EXPRESSLY DISCLAIM THAT: (i) YOUR USE OF THE SITE AND/OR SERVICES AND ACCESS TO AND USE OF ALL OF THE TOOLS AND FEATURES THEREON WILL BE UNINTERRUPTED, ERROR-FREE OR SECURE; (ii) THAT ANY INFORMATION OBTAINED THEREIN IS ACCURATE, RELIABLE OR COMPLETE; (iii) THAT DEFECTS WILL BE CORRECTED; OR (iv) THAT ANY SOFTWARE, SERVICES, SITES OR SERVER(S) ON WHICH THE SITES OR SERVICES ARE HOSTED ARE FREE OF VIRUSES OR OTHER HARMFUL COMPONENTS. YOUR USE OF THE SITE AND THE SERVICES AND ANY INFORMATION OR MATERIALS PROVIDED ON OR THROUGH THE SITE AND SERVICES ARE ENTIRELY AT YOUR OWN RISK. WE MAKE NO REPRESENTATIONS OR WARRANTIES ABOUT THE PRODUCTS OR SERVICES SOLD OR ADVERTISED HEREIN OR ABOUT THE SATISFACTION OF GOVERNMENT REGULATIONS REQUIRING DISCLOSURE OF INFORMATION ON PRESCRIPTION DRUG PRODUCTS WITH REGARD TO THE CONTENT CONTAINED ON THE SITE OR THROUGH THE SERVICES. WE MAKE NO REPRESENTATIONS OR WARRANTIES WITH RESPECT TO ANY TREATMENT, ACTION OR APPLICATION OF MEDICINE, MEDICATION OR THE INFORMATION OFFERED OR PROVIDED WITHIN OR THROUGH THE SITE OR THE SERVICES. NOTHING ON THIS WEBSITE CONSTITUTES, OR IS MEANT TO CONSTITUTE, ADVICE OF ANY KIND. Anxiety.org reserves the right, in its sole discretion, to change the Terms under which this Site is offered without notice. The most current version of the Terms will supersede all previous versions. It is your responsibility to review the Terms to stay informed of our updates. Your continued access or use of the Site or Services following changes in the TCU signifies your acceptance of the modified terms. If you disagree with the modified terms, your sole recourse is to cease access to the Site and Services. Anxiety.org reserves the right, in its sole discretion, to terminate your password, account, and access to the Site and the related services or any portion thereof at any time, without notice and for any or no reason. You agree that any action so taken may be effective without prior notice to you. We also reserve to right to discontinue, suspend, or modify the Site and any of its design, features or functionality. The Site and Service are controlled, operated and administered by Anxiety.org from our offices within the USA. If you access the Service from a location outside the USA, you are responsible for compliance with all local laws. 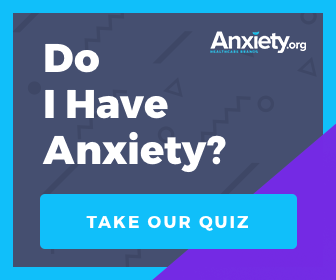 You agree that you will not use the Anxiety.org content accessed through Anxiety.org in any country or in any manner prohibited by any applicable laws, restrictions or regulations. We may perform any of our obligations or exercise any of our rights under this TCU through one or more of our company affiliates (including any entity that directly or indirectly controls, is controlled by or is under common control with us). Unless otherwise indicated elsewhere in this Agreement, (i) the term "or" shall not be exclusive; (ii) the term "including" shall mean "including, but not limited to," and (iii) the terms "herein," "hereof," "hereto," "hereunder" and other terms similar to such terms shall refer to this Agreement as a whole and not merely to the specific section, subsection, paragraph or clause where such terms may appear. The captions, section, subsection and any paragraph headings contained herein are for purposes of convenience only and are not intended to define or limit or affect, and shall not be considered in connection with, the interpretation of any of the terms or provisions of this Agreement. Any reference in this Agreement to the singular includes the plural where appropriate. Any reference in this Agreement to the masculine gender includes the feminine and neuter genders where appropriate. Terms and conditions of this Agreement which by their sense and context survive the completion, termination, cancellation or expiration of this Agreement will so survive. The failure of Anxiety.org to exercise or enforce any right or provision of these TCU shall not constitute a waiver of such right or provision. If any provision of these TCU is found by a court of competent jurisdiction to be unlawful, void or for any reason unenforceable, then that provision shall be deemed severed herefrom and shall not affect the validity and enforceability of any remaining provisions. To the maximum extent permitted by law, this Agreement is governed by the laws of the State of California, County of Orange, and you hereby consent to the exclusive jurisdiction and venue of courts in California in all disputes arising out of or relating to the use of the Site. Use of the Site is unauthorized in any jurisdiction that does not give effect to all provisions of these Terms, including, without limitation, this section. Anxiety.org may transfer, sub-contract or otherwise deal with your rights and/or obligations under these terms and conditions without notifying you or obtaining your consent. Unless otherwise specified herein, this agreement constitutes the entire agreement between the User and Anxiety.org with respect to the Site and it supersedes all prior or contemporaneous communications and proposals, whether electronic, oral or written, between the User and Anxiety.org with respect to the Site.